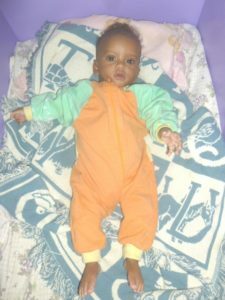 Adoptive parent searching for Ethiopian family of male, possible name Kedir, born 2013 in East Hararghe Zone- Oromia Region. He was found by Fatuma A. in Kurfa Chele Woreda, Jiru Gemechu Kebele on the side of a road wrapped in a black towel in early October 2013, at around 10 in the morning. When he was found he still had his umbilical cord and was at most a few days old. He was adopted to the USA in 2015 through Adoption Avenues and Biftu Orphanage. Orphanage or care center representative Beletech? Name of person who found the child Fatuma A. Relationship or title of person who found the child We were told no relationship to child. Others who assisted the child Mohammed A., Abdi K., Rahel A. Found in Kurfa Chele Woreda, and Jiru Gemechu Kebele on the side of a road wrapped in a black towel in early October 2013, at around 10 in the morning – when he was found he still had his umbilical cord and was at most a few days old. Kedir lived with Fatuma A. (the lady who found him) for 14 weeks until he went to Biftu Orphanage.